Bananas can be a controversial food when dealing with the doshas. Often constipating for Vatas, clogging for Kaphas and hot/cool for Pittas depending on ripeness, bananas must be eaten seasonally and in the case of home remedies, with other foods and spices. Here are 8 suggestions of home remedies with bananas by Dr. Vasant Lad posted by Sanghee Chon Davidson. *I recommend reviewing these and speaking with an Ayurvedic practitioner about your constitution and/or a physician prior to trying any out. Feel free to post a comment, question or email for a free initial consultation to vedahealth@hotmail.com. Unripe bananas are astringent and cooling with pungent after digestion. Ripe bananas are sweet and heating with a sour after digestion. Bananas are aphrodisiac and energize muscle, fat, and nerve and reproductive tissues. 1. For Emotional, obsessive eating habits: 1 banana chopped up with 1 teaspoon of ghee and a pinch of cardamom is very effective. This is also useful for hypoglycemia, constipation or muscle cramps. 2. If there is burning urination due to insomnia, constipation and acidic pH, eating 1 or 2 bananas with a pinch of cumin powder helps. This should be taken in between meals. 3. In cases of dry cough or cough without much mucus and accompanied by chest pain, eat 1 or 2 bananas with 1 teaspoon of honey and 2 pinches of ground black pepper, 2 or 3 times a day. 5. 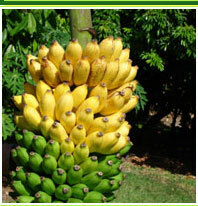 In cases of chronic bronchial asthma, insert about 7 cloves into a peeled banana and keep it overnight. Next morning eat the banana and the cloves. One hour later, drink 1 cup of hot water with 1 teaspoon of honey. This will give energy to the lungs and the wheezing should be reduced. 6. In case of diarrhea, try eating 2 green (unripe) chopped bananas with 1 teaspoon of ghee and 2 pinches of ginger powder. Drink 1 cup of hot water one hour later. 7. For excess urination often associated with diabetes, try eating 1 unripe banana with 1/3 cup of bitter melon juice, once a day. 8. To stop hiccoughs, eat 2 chopped bananas mixed with 1 teaspoon of ghee, 1/2 teaspoon of honey and 2 pinches of ginger powder. I just posted it on Facebook!! !